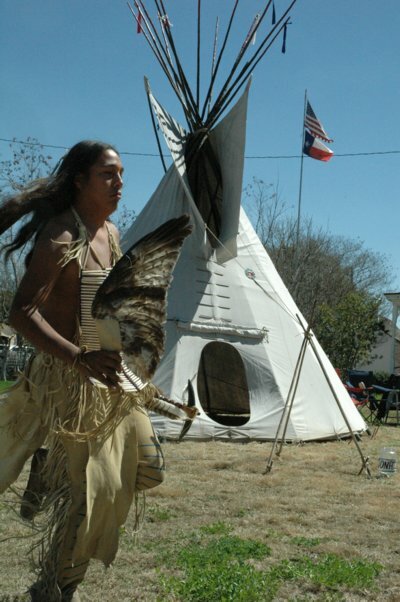 Visitors to the Spring Break event at thePioneerMuseuminFredericksburgon March 10, 12-17, 2012 can enjoy the culture of the Lakota Sioux Indians. TaCha, Tatanka, and Sunkmanitu Eagle Horse will be present daily and offer dances at various times. During a typical demonstration, TaCha, tells of the history of the Lakota Nation and describes the dances and customs. They set up a real tipi, and wear the clothes of their ancestors, complete with leather leggings, chest plates, feathers, and regalia. Other exhibits include blacksmithing, spinning, quilting, fence building, and rope making. Re-enactors representing Buffalo Soldiers and Mountain men will share their culture and history. Kids can sit in a one-room schoolhouse, taste biscuits from an authentic chuckwagon, and make old-fashioned toys. Activities take place from10 a.m. to 5 p.m., with a wide variety of hands-on activities, demonstrations and reenactments each day. There will be something for all ages to enjoy. A new addition to this year’s event is a book signing featuring two local authors, Phil Houseal ,who recently published Finding Fredericksburg: A self-guided tour through historic Fredericksburg, Texas , and Robert Deming, who will sign his book entitled Enchanted Rock Red . The book signing will take place on Saturday, March 10, from10:00 a.m. until noon. Both books are available for purchase at thePioneerMuseum at 325 W.Main. Houseal’s book is a guide to historical buildings in Fredericksburg. Deming’s book is a mystery and adventure centered around Fredericksburg’s famous Enchanted Rock. During Spring Break week, the museum’s regular exhibits and buildings also will be open for viewing. Visitors can walk through a smokehouse, blacksmith shop, and an original Sunday House. Fredericksburg is a popular destination any time of year, and especially in the springtime. This hill country town is famous for its German heritage, shopping, dining, and architecture. The new entrance to the Pioneer Museum is located right onMain Street, at 325 West Main. Parking is free.